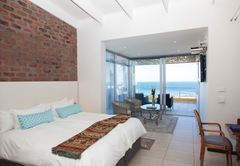 Crayfish Lodge Sea & Country Guest House is a 5 star graded guest house offering De Kelders accommodation in 5 guest rooms. 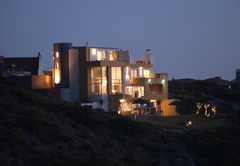 Live the warmth of the sunsets, the magic of the whales and the beauty of the sea - at Crayfish Lodge. 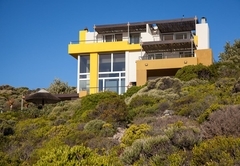 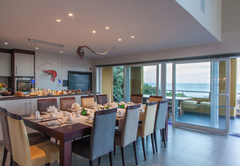 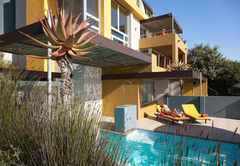 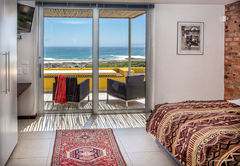 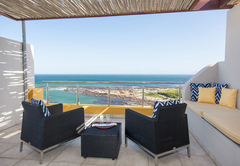 Built from scratch as a luxurious establishment, this beautiful modern true sea-front guest house is designed to let you marvel at the sound of the whales, discover this pristine coastal area and, of course, to let you simply relax. 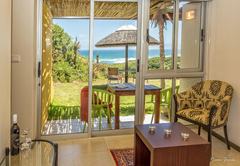 Crayfish Lodge offers 2 Panorama Suites and 3 Atlantic Garden Rooms, each having their own private patio with magnificent panoramic sea and mountain views. 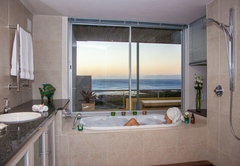 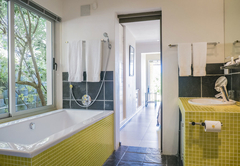 The Suites overlooking the entire Walker Bay are equipped with spacious bath area with spa bath and shower. 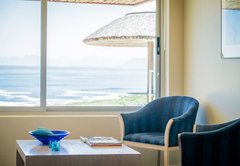 The Atlantic Rooms have direct access to the heated pool and sandy beach - which is only a short walk down through lovely Fynbos. 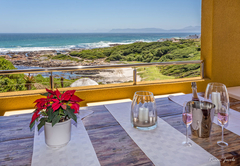 A full health breakfast buffet is served - on the sea view veranda or inside - with a wide variety of the freshest local produce to please any palate. 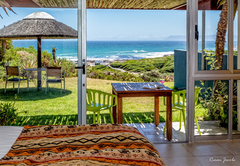 Crayfish Lodge is designed for all-year-round enjoyment. 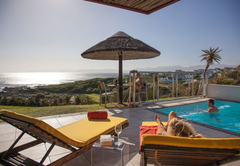 We want our guests to feel at home by using our generous lounge area, the sea view veranda and the pool deck where one can soak up the sun. 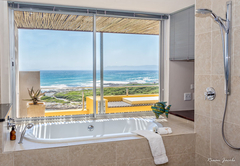 Guests can join us for morning gym, enjoy Reflexology or classic massages, Hot-Stone Therapy and Spa Baths in winter (selected beauty therapies available as well). 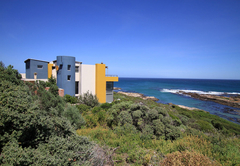 The area offers wonderful opportunities for water lovers, with different degrees of challenge. 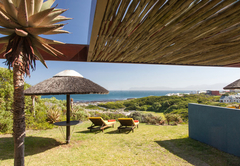 The “Big 5”, South Africa’s well-known attraction, is completed in Gansbaai with the "Big 6" and "Big 7" - the Southern Right Whale and the Great White Shark. 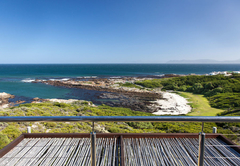 Don’t miss a boat trip to see them - and much more of our indigenous sea life species such as Penguins, Seals, Kormorans, Giant Petrels and Large Seagulls. 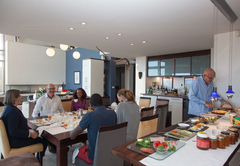 We will gladly organise your personal experience. 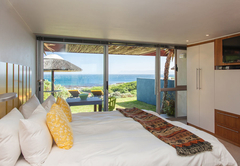 Each beautifully furnished room has its own sitting area, a private patio or courtyard with sea views (covered with beautiful pergolas for comfortable shade) and direct access to the large pool and beach. 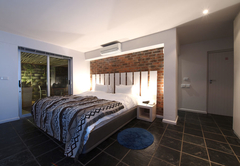 Our large luxury suites offer a high level of comfort. 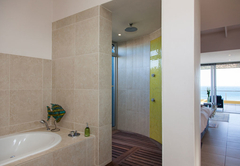 Each individually shaped and decorated. 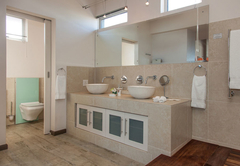 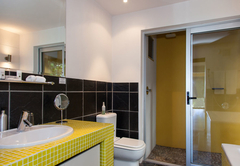 Enjoy your spacious bath area, spa bath and spa shower. 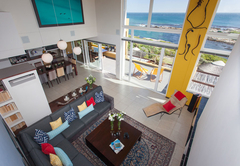 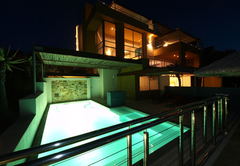 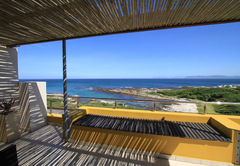 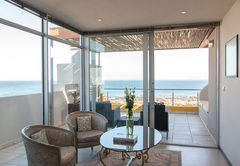 From your own private balcony overlooking Walker Bay you'll have the most spectacular panoramic views. 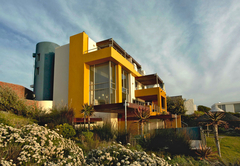 Response timeCrayfish Lodge Sea & Country Guest House typically responds to requests in 5-10 minutes.